^ a b Menzel, Donald H.; Pasachoff, Jay M. (1983). A Field Guide to the Stars and Planets (2nd ed.). Boston: Houghton Mifflin. p. 391. ISBN 978-0-395-34835-2. ^ a b Schmadel, Lutz (2003). Dictionary of minor planet names (5th ed.). Germany: Springer. p. 15. ISBN 978-3-540-00238-3. https://books.google.com/?id=KWrB1jPCa8AC&pg=PA15. ^ Chamberlain, Matthew A.; Sykes, Mark V.; Esquerdo, Gilbert A. (2007). “Ceres lightcurve analysis – Period determination”. Icarus 188 (2): 451–456. Bibcode: 2007Icar..188..451C. doi:10.1016/j.icarus.2006.11.025. ^ a b c d e f g Rivkin, A. S.; Volquardsen, E. L.; Clark, B. E. (2006). “The surface composition of Ceres:Discovery of carbonates and iron-rich clays” (PDF). Icarus 185 (2): 563–567. Bibcode: 2006Icar..185..563R. doi:10.1016/j.icarus.2006.08.022. http://irtfweb.ifa.hawaii.edu/~elv/icarus185.563.pdf. ^ a b c d e f g Li, Jian-Yang; McFadden, Lucy A.; Parker, Joel Wm. (2006). “Photometric analysis of 1 Ceres and surface mapping from HST observations”. Icarus 182 (1): 143–160. Bibcode: 2006Icar..182..143L. doi:10.1016/j.icarus.2005.12.012. http://www.sciencedirect.com/science/article/pii/S0019103506000054. ^ a b Saint-Pé, O.; Combes, N.; Rigaut F. (1993). “Ceres surface properties by high-resolution imaging from Earth”. Icarus 105 (2): 271–281. Bibcode: 1993Icar..105..271S. doi:10.1006/icar.1993.1125. ^ Angelo, Joseph A., Jr (2006). Encyclopedia of Space and Astronomy. New York: Infobase. p. 122. ISBN 978-0-8160-5330-8. ^ a b c d e f g h i j k McCord, T. B.; Sotin, C. (2005). “Ceres: Evolution and current state”. Journal of Geophysical Research: Planets 110 (E5): E05009. Bibcode: 2005JGRE..110.5009M. doi:10.1029/2004JE002244. ^ Plait, Phil (2015). “The Bright Spots of Ceres Spin Into View”. Slate. http://www.slate.com/blogs/bad_astronomy/2015/05/11/ceres_new_images_show_many_many_bright_spots.html 2019年3月31日閲覧。. ^ Ruesch, O.; Platz, T.; Schenk, P.; McFadden, L. A.; Castillo-Rogez, J. C.; Quick, L. C.; Byrne, S.; Preusker, F. et al. (2016). “Cryovolcanism on Ceres”. Science 353 (6303): aaf4286. Bibcode: 2016Sci...353.4286R. doi:10.1126/science.aaf4286. ISSN 0036-8075. PMID 27701087. http://science.sciencemag.org/content/353/6303/aaf4286. ^ a b De Sanctis, M. C. et al. (2016). “Bright carbonate deposits as evidence of aqueous alteration on (1) Ceres”. Nature 536 (7614): 54–57. Bibcode: 2016Natur.536...54D. doi:10.1038/nature18290. PMID 27362221. http://www.nature.com/nature/journal/vaop/ncurrent/full/nature18290.html. ^ a b Jean-Philippe Combe; Sandeep Singh; Christopher T. Russell (2018). “The surface composition of Ceres’ Ezinu quadrangle analyzed by the Dawn mission”. Icarus. doi:10.1016/j.icarus.2017.12.039. https://www.sciencedirect.com/science/article/pii/S0019103517308163. ^ a b c d Hogg, Helen Sawyer (1948). “The Titius-Bode Law and the Discovery of Ceres”. Journal of the Royal Astronomical Society of Canada 242: 241–246. Bibcode: 1948JRASC..42..241S. ^ Hoskin, Michael (1999). The Cambridge Concise History of Astronomy. Cambridge University press. pp. 160–161. ISBN 978-0-521-57600-0. ^ a b c d e f g Forbes, Eric G. (1971). “Gauss and the Discovery of Ceres”. Journal for the History of Astronomy 2 (3): 195–199. Bibcode: 1971JHA.....2..195F. doi:10.1177/002182867100200305. ^ Cunningham, Clifford J. (2001). The first asteroid: Ceres, 1801–2001. Star Lab Press. ISBN 978-0-9708162-1-4. https://books.google.com/books?id=CXdMPwAACAAJ. ^ Foderà Serio, G.; Manara, A.; Sicoli, P. (2002). “Giuseppe Piazzi and the Discovery of Ceres”. Asteroids III. Tucson, Arizona: University of Arizona Press. pp. 17–24. http://www.lpi.usra.edu/books/AsteroidsIII/pdf/3027.pdf. ^ Rüpke, Jörg (2011). A Companion to Roman Religion. John Wiley and Sons. pp. 90–. ISBN 978-1-4443-4131-7. https://books.google.com/books?id=FRRLOltuxDcC&pg=PT90. ^ Simpson, D. P. (1979). Cassell's Latin Dictionary (5th ed.). London: Cassell Ltd. p. 883. ISBN 978-0-304-52257-6. ^ Gould, B. A. (1852). “On the symbolic notation of the asteroids”. Astronomical Journal 2 (34): 80. Bibcode: 1852AJ......2...80G. doi:10.1086/100212. ^ Herschel, William (1802). “Observations on the two lately discovered celestial Bodies”. Philosophical Transactions of the Royal Society of London 92: 213–232. Bibcode: 1802RSPT...92..213H. doi:10.1098/rstl.1802.0010. JSTOR 107120. ^ Lang, Kenneth (2011). The Cambridge Guide to the Solar System. Cambridge University Press. pp. 372, 442. ISBN 9781139494175. https://books.google.com/?id=S4xDhVCxAQIC&pg=PR5&dq=The+Cambridge+Guide+to+the+Solar+System#v=onepage&q=The%20Cambridge%20Guide%20to%20the%20Solar%20System&f=false. ^ NASA/JPL, Dawn Views Vesta, 2 August 2011 Archived 2011-10-05 at WebCite ("Dawn will orbit two of the largest asteroids in the Main Belt"). ^ de Pater; Lissauer (2010). Planetary Sciences (2nd ed.). Cambridge University Press. ISBN 978-0-521-85371-2. ^ Mann, Ingrid; Nakamura, Akiko; Mukai, Tadashi (2009). Small bodies in planetary systems. Lecture Notes in Physics. 758. Springer-Verlag. ISBN 978-3-540-76934-7. ^ a b Cellino, A. et al. (2002). “Spectroscopic Properties of Asteroid Families”. Asteroids III. University of Arizona Press. pp. 633–643 (Table on p. 636). Bibcode: 2002aste.book..633C. http://www.lpi.usra.edu/books/AsteroidsIII/pdf/3018.pdf. ^ Kelley, M. S.; Gaffey, M. J. (1996). “A Genetic Study of the Ceres (Williams #67) Asteroid Family”. Bulletin of the American Astronomical Society 28: 1097. Bibcode: 1996DPS....28.1009K. ^ Kovačević, A. B. (2011). “Determination of the mass of Ceres based on the most gravitationally efficient close encounters”. Monthly Notices of the Royal Astronomical Society 419 (3): 2725–2736. arXiv:1109.6455. Bibcode: 2012MNRAS.419.2725K. doi:10.1111/j.1365-2966.2011.19919.x. ^ Christou, A. A. (2000). “Co-orbital objects in the main asteroid belt”. Astronomy and Astrophysics 356: L71–L74. Bibcode: 2000A&A...356L..71C. ^ Christou, A. A.; Wiegert, P. (2012). “A population of Main Belt Asteroids co-orbiting with Ceres and Vesta”. Icarus 217 (1): 27–42. arXiv:1110.4810. Bibcode: 2012Icar..217...27C. doi:10.1016/j.icarus.2011.10.016. ISSN 0019-1035. ^ Schorghofer, N.; Mazarico, E.; Platz, T.; Preusker, F.; Schröder, S. E.; Raymond, C. A.; Russell, C. T. (6 July 2016). “The permanently shadowed regions of dwarf planet Ceres”. Geophysical Research Letters 43 (13): 6783–6789. Bibcode: 2016GeoRL..43.6783S. doi:10.1002/2016GL069368. ^ Pitjeva, E. V. (2005). “High-Precision Ephemerides of Planets—EPM and Determination of Some Astronomical Constants”. Solar System Research 39 (3): 176–186. Bibcode: 2005SoSyR..39..176P. doi:10.1007/s11208-005-0033-2. ^ a b c Thomas, P. C.; Parker, J. Wm. ; McFadden, L. A. et al. (2005). “Differentiation of the asteroid Ceres as revealed by its shape”. Nature 437 (7056): 224–226. Bibcode: 2005Natur.437..224T. doi:10.1038/nature03938. PMID 16148926. ^ a b c Parker, J. W.; Stern, Alan S.; Thomas Peter C. et al. (2002). “Analysis of the first disk-resolved images of Ceres from ultraviolet observations with the Hubble Space Telescope”. The Astronomical Journal 123 (1): 549–557. arXiv:astro-ph/0110258. Bibcode: 2002AJ....123..549P. doi:10.1086/338093. ^ a b c d e Benoit, Carry et al. (2007). “Near-Infrared Mapping and Physical Properties of the Dwarf-Planet Ceres” (PDF). Astronomy and Astrophysics 478 (1): 235–244. arXiv:0711.1152. Bibcode: 2008A&A...478..235C. doi:10.1051/0004-6361:20078166. オリジナルの2008-05-30時点によるアーカイブ。. https://web.archive.org/web/20080530130946/http://www2.keck.hawaii.edu/inst/people/conrad/nsfGrantRef/2007-arXiv-Benoit.Carry.pdf. ^ Marchi, S.; Ermakov, A. I.; Raymond, C. A.; Fu, R. R.; O’Brien, D. P.; Bland, M. T.; Ammannito, E.; De Sanctis, M. C. et al. (2016). “The missing large impact craters on Ceres”. Nature Communications 7: 12257. Bibcode: 2016NatCo...712257M. doi:10.1038/ncomms12257. PMC: 4963536. PMID 27459197. https://www.ncbi.nlm.nih.gov/pmc/articles/PMC4963536/. ^ Sori, Michael M.; Byrne, Shane; Bland, Michael T.; Bramson, Ali M.; Ermakov, Anton I.; Hamilton, Christopher W.; Otto, Katharina A.; Ruesch, Ottaviano et al. (2017). 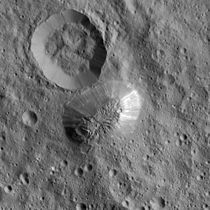 “The vanishing cryovolcanoes of Ceres”. Geophysical Research Letters 44 (3): 1243–1250. Bibcode: 2017GeoRL..44.1243S. doi:10.1002/2016GL072319. ^ Thomas B. McCord; Francesca Zambon (2018). “The surface composition of Ceres from the Dawn mission”. Icarus. doi:10.1016/j.icarus.2018.03.004. https://www.sciencedirect.com/science/article/pii/S0019103517303342. ^ De Sanctis, M. C. et al. (2016). “Bright carbonate deposits as evidence of aqueous alteration on (1) Ceres”. Nature 536 (7614): 54-57. Bibcode: 2016Natur.536...54D. doi:10.1038/nature18290. PMID 27362221. http://www.nature.com/nature/journal/vaop/ncurrent/full/nature18290.html. ^ a b c d e Marchi, S.; Raponi, A.; Prettyman, T. H.; De Sanctis, M. C.; Castillo-Rogez, J.; Raymond, C. A.; Ammannito, E.; Bowling, T. et al. (2018). “An aqueously altered carbon-rich Ceres”. Nature Astronomy 3 (2): 140–145. Bibcode: 2018NatAs.tmp..181M. doi:10.1038/s41550-018-0656-0. ^ 0.72–0.77 anhydrous rock by mass, per McKinnon, William B. (2008). “On the Possibility of Large KBOs Being Injected Into the Outer Asteroid Belt”. American Astronomical Society, DPS meeting No. 40 40: 464. Bibcode: 2008DPS....40.3803M. #38.03. http://adsabs.harvard.edu/abs/2008DPS....40.3803M. ^ a b Park, R. S.; Konopliv, A. S.; Bills, B. G.; Rambaux, N.; Castillo-Rogez, J. C.; Raymond, C. A.; Vaughan, A. T.; Ermakov, A. I. et al. (2016). “A partially differentiated interior for (1) Ceres deduced from its gravity field and shape”. Nature 537 (7621): 515–517. Bibcode: 2016Natur.537..515P. doi:10.1038/nature18955. PMID 27487219. ^ Thomas, P. C. (2010). “Sizes, shapes, and derived properties of the saturnian satellites after the Cassini nominal mission” (PDF). Icarus 208 (1): 395–401. Bibcode: 2010Icar..208..395T. doi:10.1016/j.icarus.2010.01.025. http://www.ciclops.org/media/sp/2011/6794_16344_0.pdf. ^ Neumann, W.; Breuer, D.; Spohn, T. (2015). “Modelling the internal structure of Ceres: Coupling of accretion with compaction by creep and implications for the water-rock differentiation” (PDF). Astronomy and Astrophysics 584: A117. Bibcode: 2015A&A...584A.117N. doi:10.1051/0004-6361/201527083. http://www.aanda.org/articles/aa/pdf/2015/12/aa27083-15.pdf. ^ a b Bhatia, G. K.; Sahijpal, S. (2017). “Thermal evolution of trans-Neptunian objects, icy satellites, and minor icy planets in the early solar syste”. Meteoritics & Planetary Science 52 (12): 2470–2490. Bibcode: 2017M&PS...52.2470B. doi:10.1111/maps.12952. ^ a b A'Hearn, Michael F.; Feldman, Paul D. (1992). “Water vaporization on Ceres”. Icarus 98 (1): 54–60. Bibcode: 1992Icar...98...54A. doi:10.1016/0019-1035(92)90206-M.
^ Jewitt, D; Chizmadia, L.; Grimm, R.; Prialnik, D (2007). “Water in the Small Bodies of the Solar System”. In Reipurth, B.; Jewitt, D.; Keil, K.. Protostars and Planets V. University of Arizona Press. pp. 863–878. ISBN 978-0-8165-2654-3. http://www.ifa.hawaii.edu/~meech/a740/2006/spring/papers/PPV2006.pdf. ^ a b c Küppers, M.; O'Rourke, L.; Bockelée-Morvan, D.; Zakharov, V.; Lee, S.; Von Allmen, P.; Carry, B.; Teyssier, D. et al. (2014). “Localized sources of water vapour on the dwarf planet (1) Ceres”. Nature 505 (7484): 525–527. Bibcode: 2014Natur.505..525K. doi:10.1038/nature12918. ISSN 0028-0836. PMID 24451541. ^ Campins, H.; Comfort, C. M. (2014). “Solar system: Evaporating asteroid”. Nature 505 (7484): 487–488. Bibcode: 2014Natur.505..487C. doi:10.1038/505487a. PMID 24451536. ^ Hansen, C. J.; Esposito, L.; Stewart, A. I.; Colwell, J.; Hendrix, A.; Pryor, W.; Shemansky, D.; West, R. (2006). “Enceladus' Water Vapor Plume”. Science 311 (5766): 1422–1425. Bibcode: 2006Sci...311.1422H. doi:10.1126/science.1121254. PMID 16527971. ^ Roth, L.; Saur, J.; Retherford, K. D.; Strobel, D. F.; Feldman, P. D.; McGrath, M. A.; Nimmo, F. (2013). “Transient Water Vapor at Europa's South Pole” (PDF). Science 343 (6167): 171–174. Bibcode: 2014Sci...343..171R. doi:10.1126/science.1247051. PMID 24336567. http://spacetelescope.org/static/archives/releases/science_papers/heic1322a.pdf. ^ Hiesinger, H.; Marchi, S.; Schmedemann, N.; Schenk, P.; Pasckert, J. H.; Neesemann, A.; OBrien, D. P.; Kneissl, T. et al. (2016). “Cratering on Ceres: Implications for its crust and evolution”. Science 353 (6303): aaf4759. Bibcode: 2016Sci...353.4759H. doi:10.1126/science.aaf4759. PMID 27701089. ^ Petit, Jean-Marc; Morbidelli, Alessandro (2001). “The Primordial Excitation and Clearing of the Asteroid Belt” (PDF). Icarus 153 (2): 338–347. Bibcode: 2001Icar..153..338P. doi:10.1006/icar.2001.6702. http://www.gps.caltech.edu/classes/ge133/reading/asteroids.pdf. ^ Approximately a 10% chance of the asteroid belt acquiring a Ceres-mass KBO. McKinnon, William B. (2008). “On the Possibility of Large KBOs Being Injected Into the Outer Asteroid Belt”. American Astronomical Society, DPS meeting No. 40 40: 464. Bibcode: 2008DPS....40.3803M. #38.03. http://adsabs.harvard.edu/abs/2008DPS....40.3803M. ^ a b Castillo-Rogez, J. C.; McCord, T. B.; Davis, A. G. (2007). “Ceres: evolution and present state” (PDF). Lunar and Planetary Science XXXVIII: 2006–2007. http://www.lpi.usra.edu/meetings/lpsc2007/pdf/2006.pdf. ^ Catling, David C. (2013). Astrobiology: A Very Short Introduction. Oxford: Oxford University Press. p. 99. ISBN 978-0-19-958645-5. ^ Hand, Eric (2015). “Dawn probe to look for a habitable ocean on Ceres”. Science 347 (6224): 813–814. Bibcode: 2015Sci...347..813H. doi:10.1126/science.347.6224.813. PMID 25700494. http://www.sciencemag.org/content/347/6224/813.short. ^ Martinez, Patrick (1994). The Observer's Guide to Astronomy. Cambridge University Press. p. 298. ^ Millis, L. R.; Wasserman, L. H.; Franz, O. Z. et al. (1987). “The size, shape, density, and albedo of Ceres from its occultation of BD+8°471”. Icarus 72 (3): 507–518. Bibcode: 1987Icar...72..507M. doi:10.1016/0019-1035(87)90048-0. ^ Russell, C. T.; Capaccioni, F.; Coradini, A. et al. (2007). “Dawn Mission to Vesta and Ceres” (PDF). Earth, Moon, and Planets 101 (1–2): 65–91. Bibcode: 2007EM&P..101...65R. doi:10.1007/s11038-007-9151-9. http://www-ssc.igpp.ucla.edu/personnel/russell/papers/dawn_mission_vesta_ceres.pdf. ^ Russel, C. T.; Capaccioni, F.; Coradini, A. et al. (2006). “Dawn Discovery mission to Vesta and Ceres: Present status”. Advances in Space Research 38 (9): 2043–2048. arXiv:1509.05683. Bibcode: 2006AdSpR..38.2043R. doi:10.1016/j.asr.2004.12.041. Hilton, James L. (1999). “U.S. Naval Observatory Ephemerides of the Largest Asteroids”. The Astronomical Journal 117 (2): 1077–1086. Bibcode: 1999AJ....117.1077H. doi:10.1086/300728. http://aa.usno.navy.mil/publications/reports/asteroid_ephemerides.html.